Winter Patriot: It's Official! 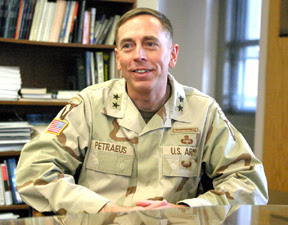 General Petraeus Will Testify Before Congress On 9/11/07 And The Date Is Simply A Coincidence! It's Official! General Petraeus Will Testify Before Congress On 9/11/07 And The Date Is Simply A Coincidence! Yesterday I wrote somewhat snarkily about the scheduling of General David Petraeus' testimony before Congress in support of "his" report on the "surge". The report attributed to General Petraeus will be written by White House staffers and is scheduled to be released on September 15th. In yesterday's piece I speculated that the timing of Petraeus' testimony -- beginning September 11th -- was purely coincidental. There wouldn't be any professional or political value in having General Petraeus testify about the Surge in Iraq on the anniversary of the September 11 attacks, would there? Apparently not. The Washington Post says administration and "opposition" figures agree with me about this. The first installment of Petraeus's testimony is scheduled to be delivered before the House Armed Services and Foreign Affairs committees on the sixth anniversary of the Sept. 11, 2001, terrorist attacks, a fact both the administration and congressional Democrats say is simply a scheduling coincidence. Simply a scheduling coincidence! How reassuring! I can't tell you how relieved I am. For a moment there I actually thought they might use our national tragedy for political purposes.